This past spring, I had the opportunity to head the education initiative “The Trans-Atlantic Slave Trade Project.” The project digitally preserved the physical evidence of three sites tied to the slave trade; Annaberg Sugar Plantation in the Caribbean, Cidade Velha in Africa, and Natchez National Historic Park in the US. The documentation was done through laser scanning, photogrammetry, and structured light technology. After the documentation was complete we worked with K-12 educators to build a variety of STEAM lesson plans for dissemination online. The goal of the lesson plans was to help students understand that by preserving the physical evidence of the Trans-Atlantic Slave Trade system, we can begin to gain a better understand of its global impact on our world and the repercussions still felt in our own local communities today. 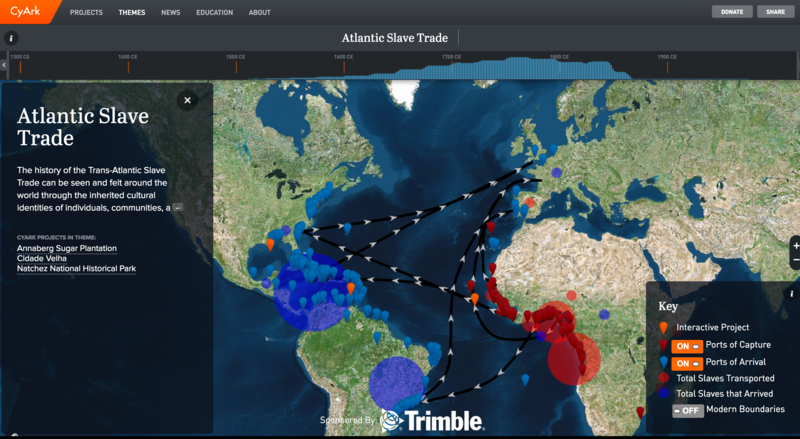 As part of the project, students were able to track the progression of the Slave Trade through historic ports and maritime routes using an interactive map, 3D models, virtual tours of sites in Africa, the Caribbean, and the U.S. The teachers and principals in attendance represented elementary, middle and high school as well as a range of subject areas including the social sciences, math, science, literacy, and the visual arts.